This is a short reminder of our final Jazz Cabaret of this season. We have had a great year of bringing jazz to the Mt. Vernon Room at St. Barnabas. We are ending this season with another theme program. 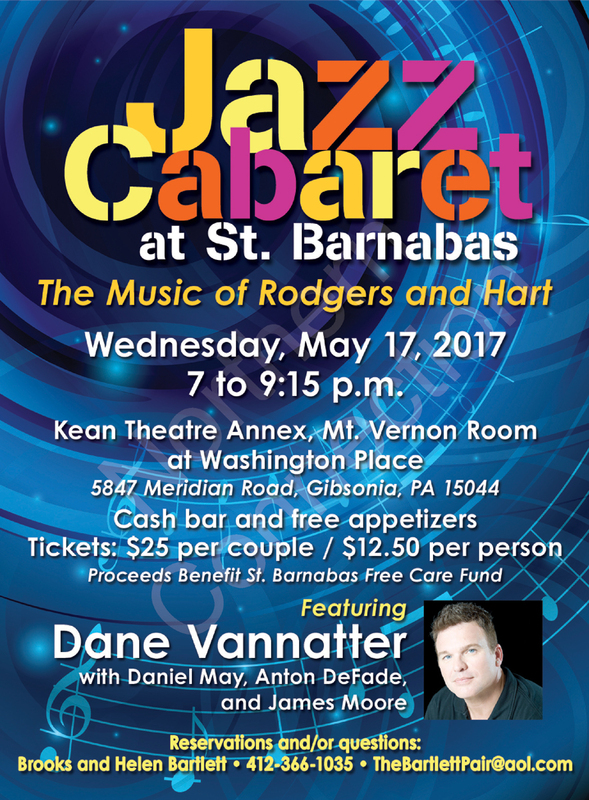 Dane Vannatter, one of the country’s great cabaret singers, will be doing an evening of music with songs of Rodgers and Hart. Accompanying Dane are three superb musicians – Daniel May on keyboard, Anton DeFade on bass, and Dr. James Moore on trumpet. This group represents some of the very best of the musicians in this region. Cash bar, free appetizers and parking. Looking forward to seeing you on Wednesday, May 17. Stay tuned for the “kick off” for our next season. On Friday, August 11, 2017, the Cabaret will move to a concert setting on the stage of the Kean Theatre. We will be presenting Joe Negri and his music. More info to follow.